Read This: Game Of Thrones fans can now buy their own direwolf. Kind of. Eventually. Every animal-lover who’s watched Game Of Thrones or read A Song Of Ice And Fire has probably found themselves wishing for their own direwolf, to serve as a loyal companion and occasional mauler of heinous boy kings. Alas, Canis dirus went extinct millennia ago, but now thanks to The Dire Wolf Project, direwolves are making their way back to reality—sort of. 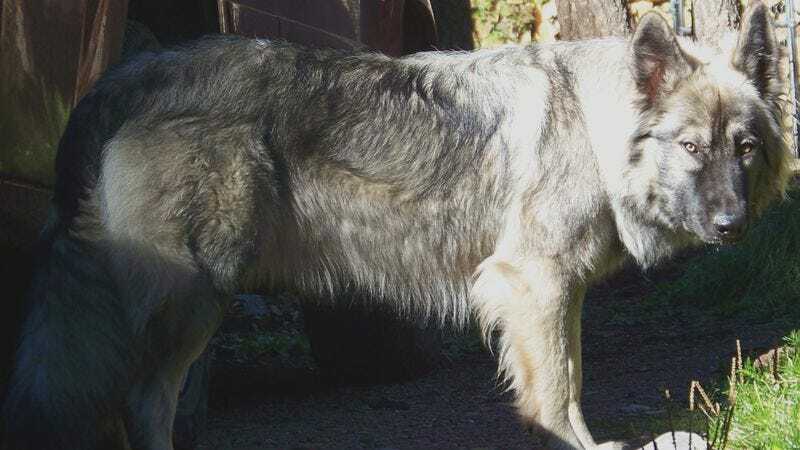 As detailed in this interesting piece from Wired.com, the breeding project isn’t concerned with bringing back true, prehistoric direwolves, for which there’s no remaining genetic material, but rather with creating a domesticated, “wolf-like” companion dog breed that has the look of a direwolf, but with a more gentle temperament (and, presumably, without telepathic connections to their owners). Topping out at 130 pounds and selling for around $3,000—there’s currently a long waiting list for pups—Direwolves v.2.0 look more like adorable cuddle monsters than regal killing machines, but that’s probably for the best. Consider them the canine equivalent of GOT cosplay.